Sugar Bowl’s Georgie Sullivan (middle) captured first place in super-G earlier in the week. Teammates Piper Sage (left) and Anna Zaruby completed Sugar Bowl’s sweep of the podium at the event in Canada. 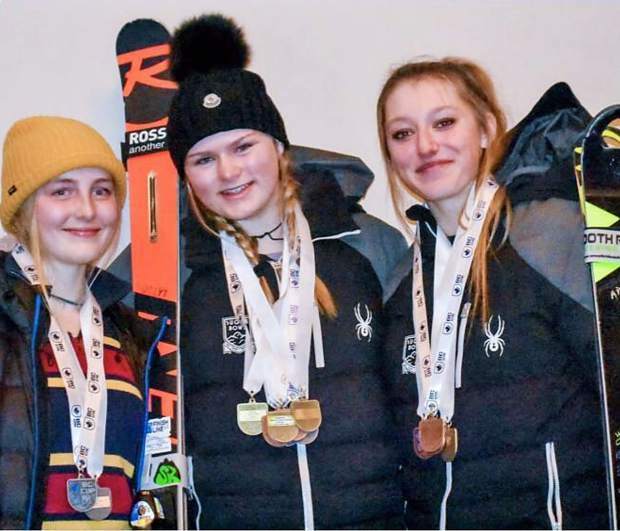 A trio of Sugar Bowl Ski Team & Academy athletes swept the podium earlier in the week at Kimberley Alpine Resort in British Columbia, Canada. Georgie Sullivan, 16, led the sweep of the super-G race on Monday, finishing the course with a time of 1 minute, 22.16 seconds. Teammate Piper Sage, 16, was second with a time of 1:23.57, followed by Sugar Bowl’s Anna Zaruby, 16, who finished in third place with a time of 1:23.65. Sugar Bowl also had Abigail Larrabee (11th place), Jillian Larrabee (20th place) and Maris Toalson (29th place) competing in the event. The victory for Sullivan has highlighted a strong week of racing for the teenager. She also landed on the podium in four other races, taking third place in downhill, third place in slalom, second in downhill, and a second-place finish in super-G.
Sage’s week included a pair of sixth-place finishes in downhill racing. Zaruby captured a fourth-place finish in downhill, and a sixth in slalom. The International Ski Federation World Ski Championships began earlier in the week in Are, Sweden, with a round of super-G racing. Squaw Valley’s Bryce Bennett, 26, finished his day in 23rd place, posting the third fastest time of any American. Italy’s Dominik Paris captured the championship. Squaw’s Travis Ganong did not finish his run. North Tahoe skier AJ Hurt, 18, returned to North American Cup racing last Wednesday, but had some difficulties with the day’s two slalom events at Snow King Mountain Resort in Jackson, Wyoming. Hurt raced to a ninth-place finish in one event and was unable to finish her second run of the other. The two races knocked Hurt from atop the North American Cup leader board, as another rider with local ties, Nina O’Brien, 21, took over the lead. O’Brien, who grew up racing for Squaw Valley Ski Team, took a pair of second-place finishes in the slalom events to move 29 points ahead of Hurt for the overall lead in the cup standings. Racing continues Thursday and Friday at Snow King with two rounds of giant slalom.